The Walker Carryon is available in two styles a side mount and a front mount. It makes the perfect compliment for every walker. The side mount Walker Carryon has a detachable beverage holder pockets big enough to let you store your personal items. The front mounted carryon also features a detachable beverage container and a spacious storage compartment but also has three pockets that are deep enough to help you store a variety of personal items like cell phones remotes or other items within reach. 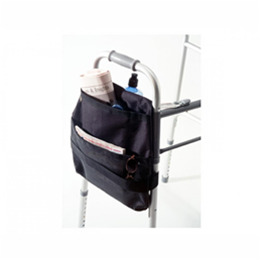 The Walker Carryon both the side mount and front mount are equipped with a dual-strap attachment that tightly holds them to the walker frame. They are made of nylon and available in black. Both are covered with a one-year limited warranty. The Walker Carryon, both styles, feature a dual-strap attachment which anchors the carryon securely to the walker frame. 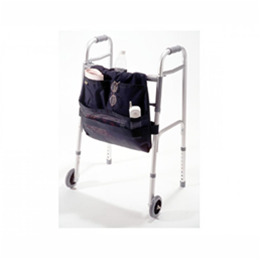 Both styles of the Walker Carryon feature a large storage pocket for storing personal items. The beverage holder attaches securely with a snap, so it can be easily removed when not in use. The detachable beverage holder is a feature of the side mount as well as the front mount Walker Carryon.